It's tough to imagine the Wright Brothers could have ever envisioned what today's air travel looks like back on that day in Kitty Hawk when they finally got their flimsy flier a few hundred feet off the ground. Though it's fairly certain they'd be pretty stoked to see what just happened this past weekend, when the world's largest airplane -- with a wingspan longer than a football field -- took flight for the first time ever. 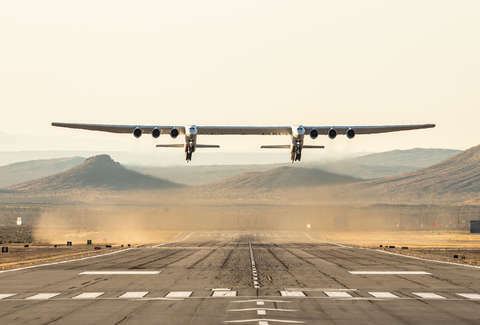 Built by the company Stratolaunch, the world's largest airplane, which weighs an astonishing 500,000 pounds and has a wingspan of 385 feet, took flight for the first time on Saturday, April 13, over the Mojave Desert in California. The test flight marks the first the time the duel-fuselage aircraft hit the skies after years of engineering and development. It was an occasion met with cheers and celebration from onlookers who watched it take off, then land about two and half hours later at the Mojave Air and Space Port. As impressive as the fact that a plane this massive can fly, you may be curious why it's so huge. Well, it's designed to carry rockets up to about 35,000 feet, where they'll then blast off into orbit. The thinking is that launching them in the air is both more efficient, and allows for crews to bypass bad weather or other conditions that can lead to delays. 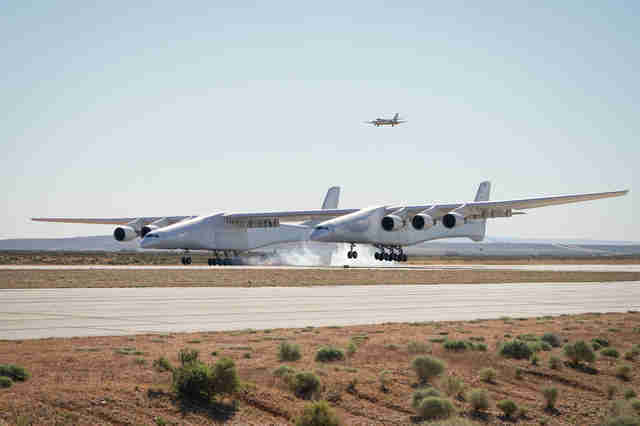 And while there wasn't a rocket involved on this flight, Northrup Grumman has partnered with Stratolaunch to help launch its Pegasus XL rockets at some point in the future, according to The Verge. The company considered the flight a success, though it only reached an altitude of 17,000 feet and one test pilot said there were a "few little things that were off nominal," according The New York Times. The vessel, which features six turbofan engines, was built by reassembling two used Boeing jets. "The flight itself was smooth, which is exactly what you want the first flight to be," said test pilot Evan Thomas, during a press briefing following the flight. "And for the most part, the airplane flew as predicted, which is again exactly what we want." While in the air, the aircraft reached a max speed of 175 miles per hour. Last summer, Stratolaunch announced it was planning to develop a "family" of launch vehicles like this one, though it's since changed course as there were concerns that demand may not be high for its services. In January, the company laid off 50 employees. In any case, three cheers to them for getting a metal bird the size of a city block into the sky.